Plaid Enterprises – Manufactures craft and instructional products for hobbyists and professionals. – Manufactures craft and instructional products for hobbyists and professionals. Plaid Enterprises, Inc., is one of the world’s largest, most diverse manufacturers of creative do-it-yourself products. Our product innovation and dedication to the ever-changing needs of consumers have made the Plaid family of products among the most recognized and desired brands worldwide. Plaid’s first product category was how-to publishing covering the hottest crafts of the era–macramé, beading, decoupage and decorative painting. The company soon expanded to manufacture the products called for in how-to books. Paint was one of the first products targeted, and production began in consultation with leading decorative artists. Today, Plaid is the industry’s leading small batch paint manufacturer, producing all USA-made paint in facilities located outside of Atlanta, GA. 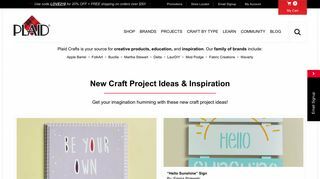 The company continued to evolve with the craft industry, developing products in tune with trends—stenciling, faux finishes, fashion, glass crafts—reaching out to new artists and markets, including home improvement. Plaid was also the first craft company to sell products on television via infomercials and home shopping channels. Notable brands in Plaid’s portfolio include FolkArt®, Gallery Glass®, One Stroke™, and one of the industry’s best known, Mod Podge®, a favorite since 1967. In 1996, Bucilla, the nation’s needlecrafts leader, was added to the Plaid fold. Today, Plaid remains true to its roots, leading the way and setting standards for craft products, programs, marketing, inspiration and education.